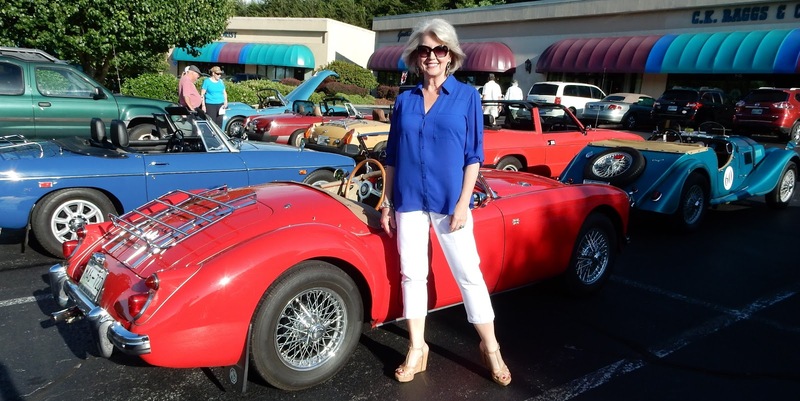 We always enjoy attending the Drive Your British Car Show. It is hosted by Gourmet & Company in Johnson City, TN each May. This is always a relaxed casual event. We visit with lots of old friends while we admire the beautifully restored cars. My look for this year included white capri pants from Chico's with a royal blue Portofino shirt from Express. The wedge sandals are from Dillard's last year. Above with Mr. Mickey and below with Ben Bailey. They have been friends since childhood. This is always a fun evening! Affiliate links in this post may generate commissions for Fifty, not Frumpy. On the last day of our Martha Washington Inn visit, we had a leisurely late breakfast before taking a long drive through the country on our way home. Two weddings were held at the Inn this weekend so there were abundant flowers everywhere. For the drive home, I wore a fuchsia washable linen boxy shirt with a tie front and a longer back from Chico's. The pull on smooth fit khaki pants are by Fabrizio Gianni. These super comfortable pants are made in the USA. Fabrizio Gianni offers Shop & Dash! That means you can order four or more items, try them on at home, pay only for what you keep. Free shipping both ways! I hope you have enjoyed the photos from our weekend getaway and that we gave you some ideas for what to wear during your own fun times. More adventures coming soon! What could be more romantic than dinner with a glass of good wine and great conversation with your best friend? On our last evening at the Martha Washington Inn I wore a blue Traveler's jacket with a deep blue tank and white pants all from Chico's. The jacket has a unique design. The back is short and the front sides are long. The shoes are old by Jessica Simpson via T.J.Maxx. The large link necklace and smooth silver cuff are also from Chico's. This charming couple struck up a conversation and then joined us on the porch for a nice visit before dinner. At the end of our lovely evening, we made our way down to the pool and out to the fire pit to sit and chat as the sun was going down. A champagne brunch is the perfectly timed meal for us while on a weekend getaway. Wearing layers always feels more comfortable to me. In warm weather, I enjoy wearing light flowing sheer sweaters and dusters over white pants and a tank. This long duster from Chico's is one I have worn before on the blog. Some of you asked about the back panel last time. You can see here with the white pants and tank that it is a panel of navy blue lace. I always tell you the source of what I am wearing, but it may not be from the current season's stock. I have built a wardrobe to last me for years, so I will only be adding a few new items each year. I like to think I am leading by example. I hope to inspire you to shop with a plan and then to put together outfits from your own closet. The shoes are by Sam Edelman. The rings are old. The cuff and necklace are from Chico's and all of my clothes are as well. I appreciate that Mr. Mickey always looks so dapper when we go out. These are his choices. I do not help him with his wardrobe. Photos were taken while on holiday at The Martha Washington Inn. Do you find that you take too much with you when you travel? In warm weather, I normally pack black pants, white pants and a pair of jeans along with a few tops and a jacket that can each be worn with any of the pants. I take no more than three pairs of shoes. All the pieces in my look are from last year. The pants and the necklace are from Chico's. The tank is by Adea. The split back shirt is by BCBGeneration. The shoes are by Guess. We stayed at the Martha Washington Inn this past weekend. We had most of our meals there so that we wouldn't have to send for the car. It's the perfect way to relax for us. We love to stay at a hotel that has a couple of restaurants, a nice Spa, a great view and live entertainment or a library. My stylist tells me that if you are going to let you hair go gray you must always have a crisp style and great cut otherwise you will look unkempt. It's time for a trim! Before dinner, we took a stroll through the angel garden. We shared Mr. Mickey's favorite butter pecan bread pudding for dessert. After dinner, we sat on one of the huge porches of the Inn to watch the sun go down. We really enjoy a long weekend away from the regular day to day life that keeps us so busy most of the time. I don't mind if we do nothing more than sit in a wicker chair on the front porch of a Bed and Breakfast for two days watching the world go by. Sometimes I just have to unplug and unwind. Mr. Mickey snapped these photos as we were leaving for a long weekend stay at the Martha Washington Inn. I often look in my closet and think, what have I not worn yet? It becomes a challenge to wear that item today. I am determined to make use of every item I purchase or else give it to someone who will enjoy it. Leaving items in the closet for years with the tickets still on them seems very wasteful to me. I bought this light blue sequined front top with tab sleeves at Chico's a few months ago, but the weather had not yet been warm enough to wear it. The fun Sam Edelman sandals have an artistic sculptural heel with lots of straps in a copper color. Today was the day for both items to be worn for the first time. The white ankle jeans are also from Chico's. On a recent Friday evening, we got together with our Wine Club friends to enjoy tasting some great wines from Portugal. I wore white jeans and a white tank with a lace front Travelers jacket and a necklace all from Chico's. The black pumps are by Steve Madden. We always look forward to seeing Rick and Sandy Jelovsek again because we learn so much from them, but we also get to meet new friends each time we get together. Larry and Debbie England graciously hosted this tasting event at their beautiful home. Rick is discussing what regions of Portugal the featured wines are from. I have worn this topper with all black in the past here, but I like the contrast with the white much better. Try combining some of your wardrobe pieces in a different way. Sometimes you can find a new favorite outfit you never considered before.